Southern Ecuador is an active mining area and an important source of livelihood and income for the local and national economy. Historically, the primary extractive activity in this area has been the artisanal and small-scale mining (ASM), which is concentrated in Portovelo-Zaruma and Ponce Enriquez regions. These regions have been the focus of intense research and investigation not only because of their mineral wealth, but also because of the social and environmental impacts resulting from ASM activities. While scientific, technological and entrepreneurial advancements have allowed Zaruma-Portovelo and Ponce Enriquez to become the driving force of the regional economy; they have also deepened inequalities and led to a creation of a mineral extraction business model that means high profits to some, and mere existence to others. 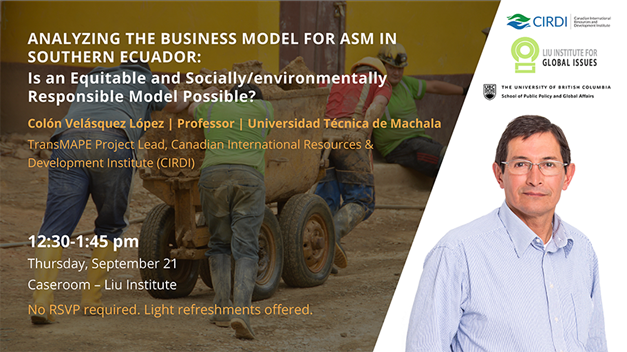 The purpose of this presentation is to analyze the current business model in the extraction of precious metals within ASM context in order to identify barriers to a more equitable and socially and environmentally responsible development. Patricio Colón Velásquez López is a professor at the Faculty of Agricultural Sciences, at the Technical University of Machala in Ecuador. 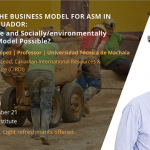 He also leads CIRDI’s TransMAPE project, which focuses on the development of educational programs for Ecuador’s artisanal and small-scale gold mining (ASGM) communities. He holds a Master’s degree in General Aquaculture from Ghent University, Belgium and a PhD in Mining Engineering from the University of British Columbia. His master’s research focused on the bioavailability of heavy metals in aquatic organisms. At that time, he was director of the aquatic laboratory at the Technical University of Machala where his research focused on monitoring water quality in the coastal zone and studying pond ecosystems in Southern Ecuador’s shrimp farming industry. His doctorate studies focused on mercury behaviour in the amalgamation and cyanidation processes in ASGM, and understanding mercury releases and impacts on aquatic resources. For three years he served at the appointment of the Government of Ecuador in the role of Executive Director of the National Institute of Geology, Mines and Metallurgy (INIGEMM). His major achievements at INIGEMM include implementating geo-scientific infrastructure and analytical laboratories, creating a geological and mineral resources mapping project in the Ecuadorian territory, and managing projects to improve working conditions and implement training programs in Ecuador’s ASGM sector. Colon brings together his ASM research and project work with his aquatic sciences background to apply a multidisciplinary approach to integrated water resource management to achieve sustainable mining in developing countries.